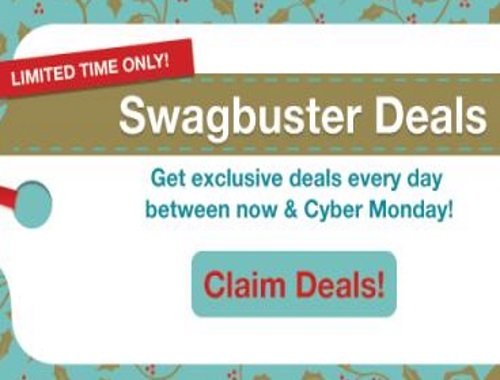 Running now through December 3, the cashback shopping site Swagbucks is running a series of exclusive "Swagbuster" deals that offer increased cash back (in the form of SB points) at stores, when buying gifts cards, and big SB payouts when you discover offers from different companies. You can take all of the points you earn from these deals and redeem them for gift cards from places like Amazon, Target, Walmart, Starbucks, or PayPal cash, helping you extend your holiday budget further! The deals change every few hours, and you can keep track of what's available by clicking here. You need a Swagbucks account to take advantage - fortunately it's free and takes less than 30 seconds to sign up. PLUS, if you sign up through me you'll get a bonus 300 SB ($3) if you earn 300 SB before December 1!